GAINESVILLE, Fla. - When Efram Goldberg's dog, Darwin, developed an ulcer near his tail in late July, Goldberg first sought help from his veterinarian, who diagnosed a bacterial infection and administered antibiotic treatment. When the ulcer worsened, Goldberg grew increasingly concerned and did some research that led him to think Darwin might have a rare, life-threatening disease called pythiosis. In the course of his research, Goldberg, a graduate student in Melbourne, discovered that the University of Florida had treated pythiosis in horses. On Aug. 2, he called the UF Small Animal Hospital's emergency and critical care service and brought Darwin to Gainesville the next day. "I went to the emergency room and told them what had been going on, and that I thought Darwin might have pythiosis," Goldberg said. "Right away, they admitted him and performed several biopsies." Canine pythiosis is a rare and deadly tropical disease caused by the fungus-like pathogen Pythium insidiosum. The form of the disease that affects the skin causes tumor-like lesions that develop mostly on the tail, legs, thorax and abdomen. Although rare, the disease most frequently affects horses, dogs and, in some cases, humans. The pathogen is often found in stagnant waters, such as small lakes or ponds. Based on the appearance and behavior of Darwin's ulcer and his history of swimming in and drinking from a pond, Goldberg came to suspect that infection with pythiosis could be the cause of Darwin's skin lesion. On Aug. 5, UF veterinarians confirmed that Darwin had tested positive for pythiosis. 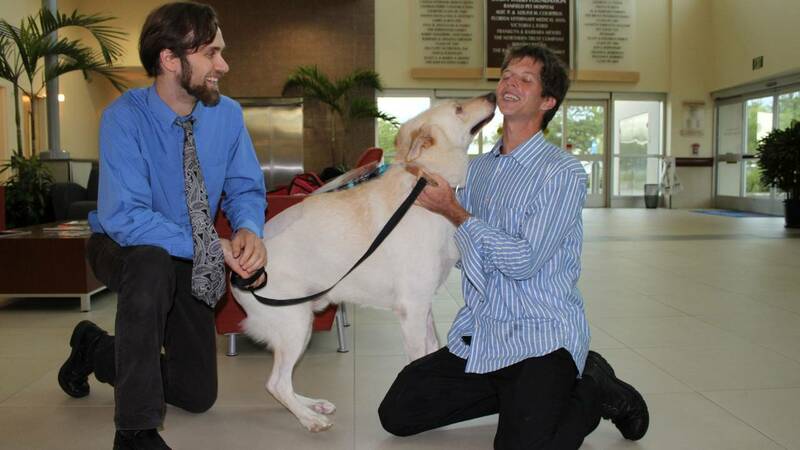 Subsequently, the dog received surgery to amputate his tail and remove the ulcer on his hip — procedures that were performed by J. Brad Case, D.V.M., an assistant professor of small animal surgery at UF. Darwin also received additional medical therapy and several treatments in the Small Animal Hospital's hyperbaric oxygen chamber, organized by Justin Shmalberg, D.V.M., a clinical assistant professor and chief of the integrative medicine service. Meanwhile, Goldberg's local veterinarian is now providing Darwin with an immunotherapy vaccine. Goldberg also continues to be passionate about raising awareness about the disease, not only among pet owners, but also among veterinarians. "At the end of the day, the veterinarians have the responsibility for ordering tests, prescribing medicine and making a diagnosis," Goldberg said. "So I think having them be more aware will ultimately save more dogs than owners coming in and trying to educate them." Shmalberg said he was encouraged by Darwin's progress. "I appreciate how dedicated Efram was to Darwin's well-being," he said. "Most veterinarians see at most one case of pythiosis in their career, so it's understandable that the infection can take some time to diagnose. We are currently working with a variety of novel treatments for the disease and have had some successes with severe cases, both with and without surgery." Shmalberg added that UF veterinarians hope to be able to use their growing knowledge and resources to better manage pythiosis cases in the future. "We would like to give Efram and other owners more hope for this rare but frequently deadly disease," Shmalberg said. Goldberg said Darwin is much improved since his treatment at UF, recently even going outside to play again. "I've been spoiling him," Goldberg said. "I am very grateful that the UF veterinarians took my concerns seriously and tested him immediately."